What’s for dinner? That’s what I asked myself last night. 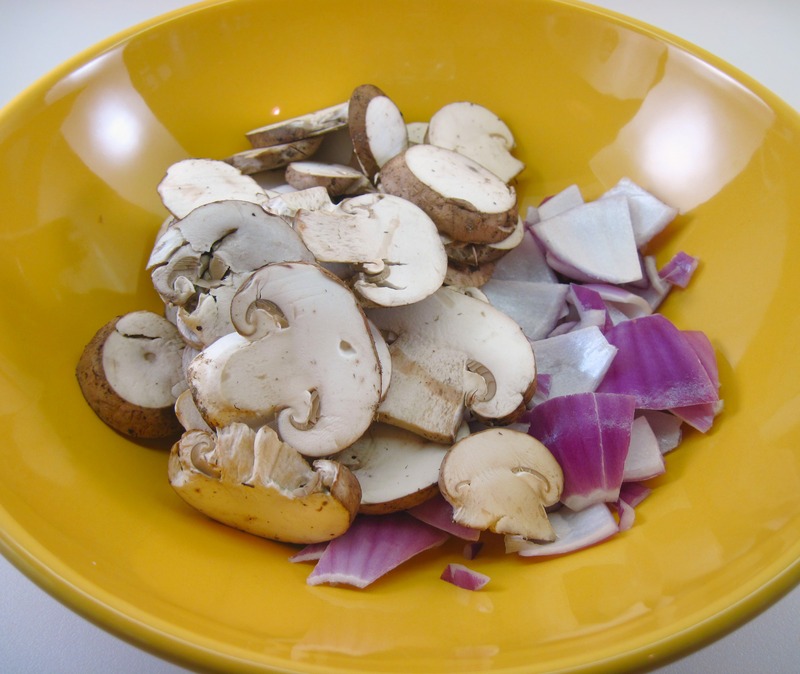 I wanted to use the chicken thighs and sliced mushrooms that were in the refrigerator. 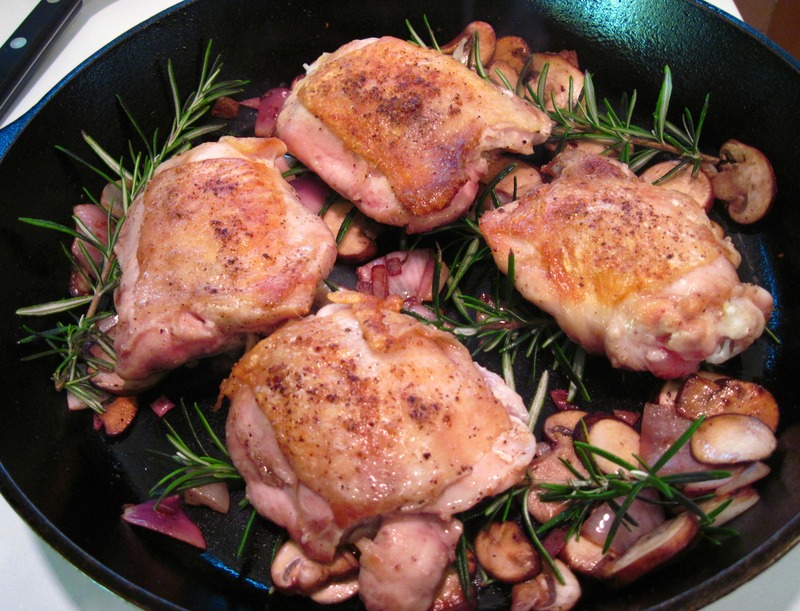 I did a quick search on Kalyn’s Kitchen and found her Pan Roasted Chicken with Mushrooms, Onions, and Rosemary. Perfect! Kalyn adapted her recipe from one in Eat This Book: Cooking with Global Fresh Flavors, by Tyler Florence. She says Tyler made a pan sauce after the chicken was done, but she chose not to do that. I added just a bit of water to the pan after removing the cooked chicken to make a simple sauce. The original recipe serves 4; I cut it in half for a “dinner for 2”. 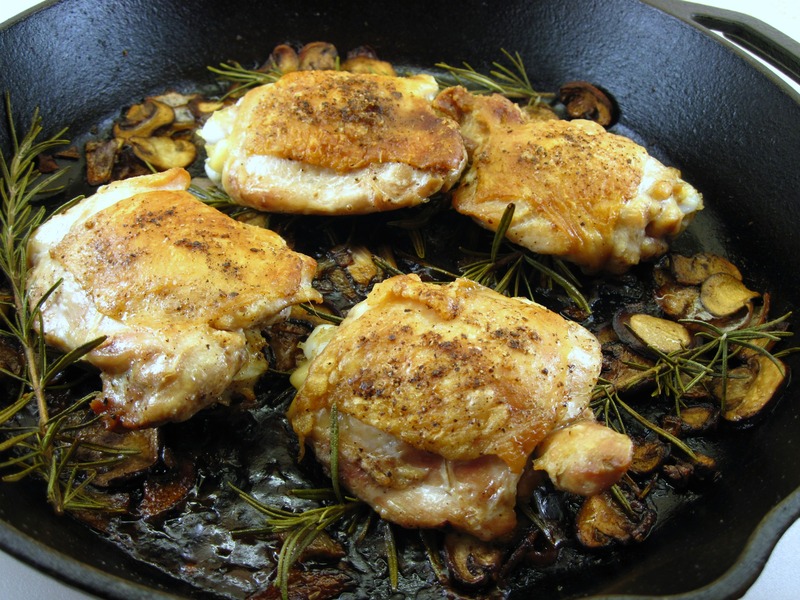 If you have a cast iron skillet you can go right from the stove-top to the oven with it. If you don’t have an oven-proof skillet, you’ll have to put everything in a casserole after the initial browning. 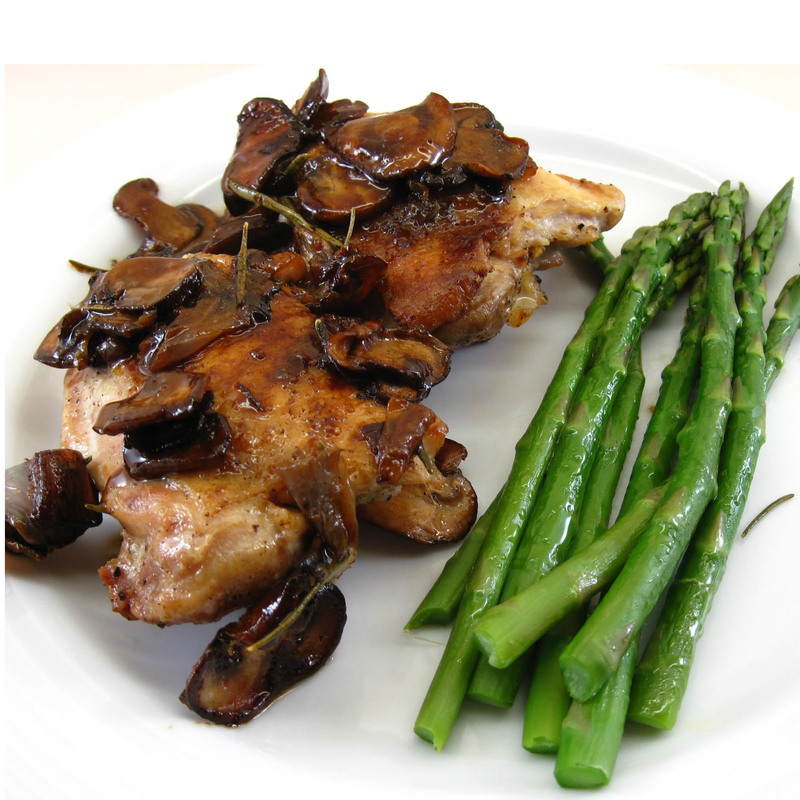 Pan Roasted Chicken with Mushrooms, Onions, and Rosemary has a lot of flavor and is an easy weeknight meal. Next time I might add some garlic cloves just because I think garlic would make it even better! 1. Preheat the oven to 350˚. 2. 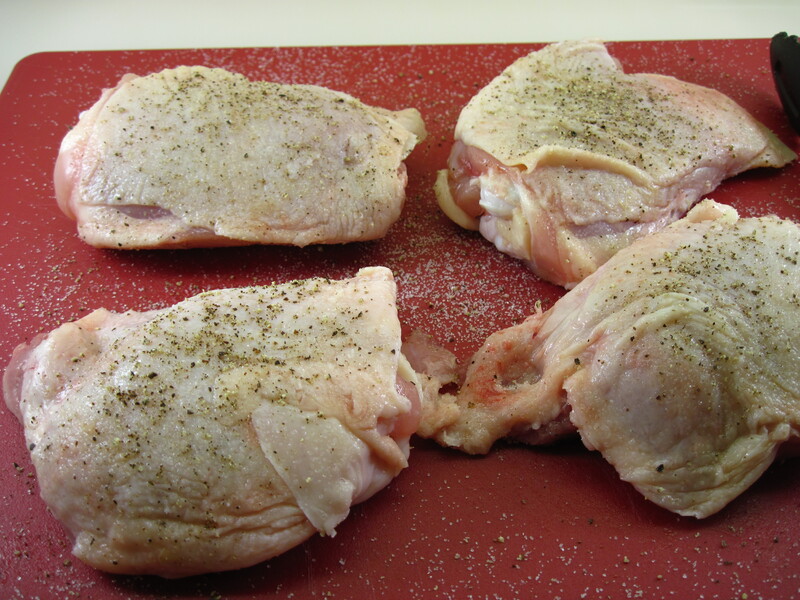 Generously season the chicken thighs on both sides with salt and pepper. 3. Heat a skillet over medium heat. Add the oil. 4. When the oil is hot, add the chicken thighs, skin-side down. Let them brown for about 10 minutes. 5. Turn the thighs over and brown for another 5 minutes. 7. 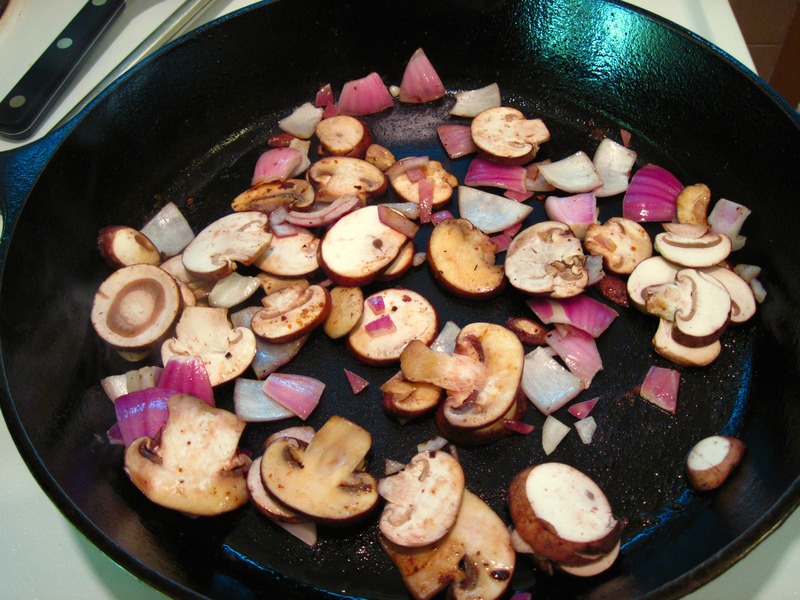 Add the onion and mushrooms to the pan and cook, stirring occasionally, for about 5 minutes. 8. Add the rosemary sprigs. 10. Roast for 40 minutes or until done. 11. 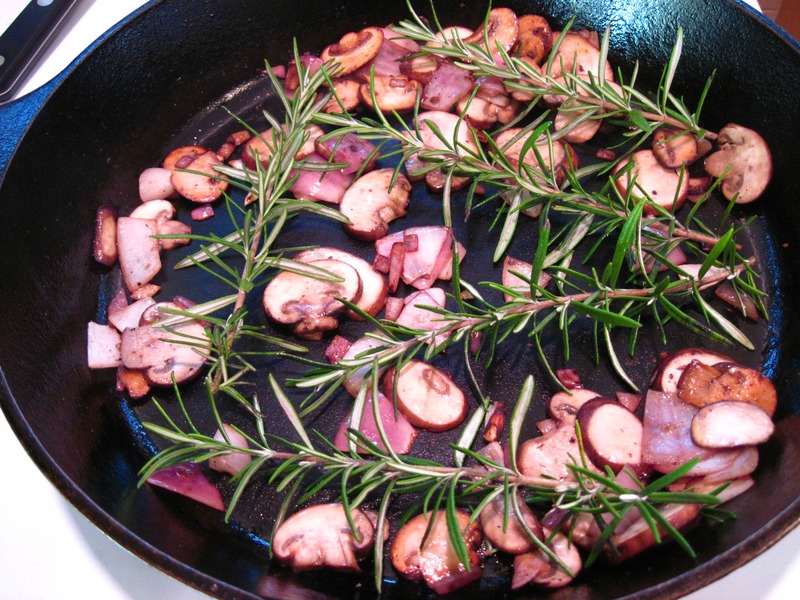 Remove and discard the rosemary sprigs; take the chicken and vegetables out of the pan. 12. 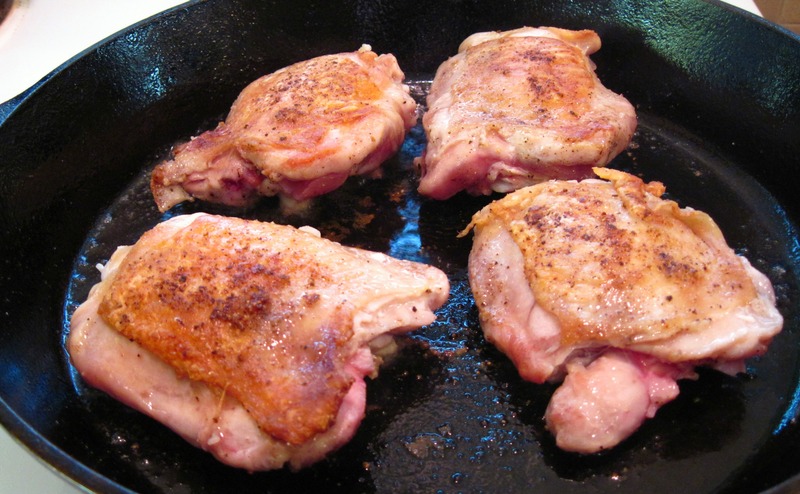 If you have roasted the chicken in a skillet, you can make a quick pan sauce. Tip the pan to spoon out some of the excess fat. Then add the ¼ cup of water to the pan. Cook, stirring, for 2 or 3 minutes. Serve the chicken with the sauce. I just love chicken thighs. So much meatier and richer than all white meat. Love this recipe. Saved. Your photo of the finished dish is fantastic. So glad you enjoyed it! I love anything with rosemary. I can’t wait for fresh asparagus, too. We’re lucky to have a huge rosemary bush for year-round use. Fresh, local asparagus in the spring is the best! I have to splurge on imported asparagus now and then, though, because I love it so much. So good! I usually like chicken breasts and my mom loves thighs. I’m going to have to make this for her. Thank you for sharing. I hope you have a blessed week, my friend. I’m sure your mom will love it, Monet! What a sweet thing to do for your mom. You have a great week, too! Thank you for this recipe and the basic but comprehensive layout and description. It looks as though it allows you to put your own personal twist to it regarding flavours, ie adding garlic etc. Looking forward to trying this tomorrow.